The hotel is just a five minute walk from the main rail station and close to all the central locations in the city. If you're planning any trips during your stay, please take a look at our Leeds destination guide. Fares are inexpensive with joint bus, train and ferry tickets available. See Wymetro.com for more information. From the M62/Manchester Take junction 27 and then from the M621 take junction 3. Follow signs for Central Leeds. After the second set of traffic lights get into the right hand lane. Bear Right, pass through one set of traffic lights (ASDA House will be on your left hand side) Pass through one set of traffic lights at Tetley's will be on your left hand side. Get into the left hand lane at the next set of traffic lights bear left follow this road after 500 yards turn left into Bowman Lane. Jurys Inn Leeds is 500 yards on your right hand side. Jurys Inn Leeds is committed to helping support the Leeds Clean Air Zone and recommends not bringing cars into the city but rather availing of Park and Ride operators. Should you require any further guidance please contact us directly at the hotel. Start out going northwest by turning left from the airport. Turn left onto Whitehouse Lane. Enter next roundabout and take 1st exit onto Victoria Avenue, leading onto Harrogate Road. Turn slight left onto Leeds Road, leading onto Rawdon Road. Enter next roundabout and take 2nd exit onto New Road Side which leads onto Abbey Road. Abbey Road then merges with Commercial Road, which then merges with Kirkstall Road. Turn slight left onto West Street. Turn slight right onto A58. Stay in middle lane to go into Wellington Street. Turn right onto Northern Street, and then right onto Whitehall Road. Take the first left onto Globe Road. Follow the road round and at the traffic lights, turn right but bear left onto Great Wilson Street. Keep left and follow the road round. Get into the right hand lane and turn right over onto Dock Street (you will pass the Adelphi Pub). Follow the road round to the left onto Waterloo Street. Jurys Inn Leeds is about 200 yards down, on the left hand side. Jurys Inn have partnered with Streamline telecabs to offer guests a discount on travelling from Leeds Bradford Airport. A fare of approx. £21 one-way has been agreed with Streamline telecabs for guests staying at Jurys Inn. Cars can be booked in advance on +44 (0) 113 2443322. To get to our hotel from the Airport hop on 757 bus and get off at Leeds interchange station, which is just a 6 minute walk from our hotel. Take junction 43 off the M1 onto the M621; take junction 3 and follow signs for Central Leeds. After the second set of traffic lights get into the right hand lane. Bear Right, pass through one set of traffic lights (ASDA House will be on your left hand side). Pass through one set of traffic lights at Tetley's will be on your left hand side. Get into the left hand lane at the next set of traffic lights bear left and follow this road. After 500 yards turn left into Bowman Lane. Jurys Inn Leeds is 500 yards on your right hand side. Adjacent to the hotel you will find Brewery Wharf Tetley Car Park, The Brewery, Hunslet Road, Leeds, LS10 1JQ. This is operated on a Pay and Display basis, 24 hours, 800 spaces and open air. Each 24 ticket you purchase will expire at midnight therefore we advise to purchase two 24 hours tickets to display for overnight stays in the carpark. Follow the link to prepay online or for more information - Brewery Wharf Tetley Car Park. 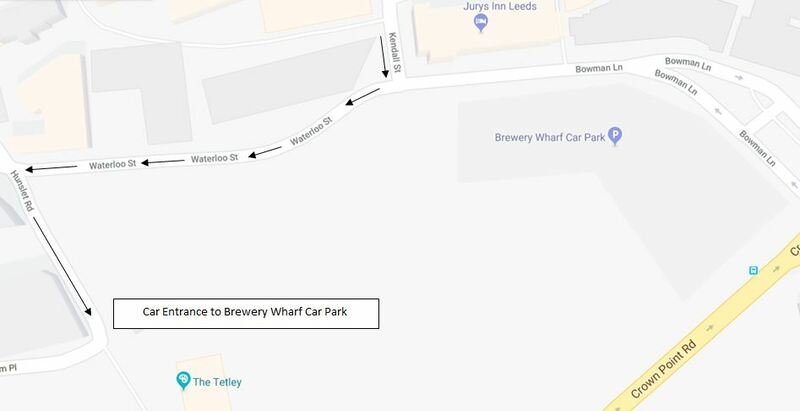 *Please note, the best way to walk back from the Brewery Wharf Car Park to the hotel is back through the entrance to the car park. There is also 38 on road Pay and Display parking spaces directly outside the hotel (council owned). *Opening times and prices may change at the car park operator’s discretion and as such the information is a guideline only.